For other uses, see Fiat Abarth 124 Rally and Fiat 124 Spider (2016). The Abarth 124 carries over the 1,368 cc (1.4 L; 83.5 cu in) MultiAir turbo I4, upgraded to deliver 170 PS (125 kW; 168 bhp) at 5,500 rpm and 250 N⋅m (184 lb⋅ft) of torque at 2500 rpm. It has a top speed of 232 km/h (144 mph) and can accelerate from 0-100 km/h (62 mph) in 6.8 seconds. The Abarth 124 Spider features many changes from its Fiat counterpart. On the exterior these include Abarth badging, an optional black racing stripe hand-painted on the hood and decklid, and 17 inch aluminum wheels. The interior features heated black leather and microfiber sport seats with the option of leather and Alcantara suede Recaro seats. It also features a leather wrapped sport steering wheel and gear knob as well as red accent stitching. The Abarth 124 Spider Rally is a rally version of the 124 homologated in the FIA R-GT category. It has a 1.8 litre turbocharged engine with 300 PS (221 kW; 296 hp) at 6,500 rpm. ^ Turkus, Brandon (18 November 2015). "2017 Fiat 124 Spider questions if the answer is always Miata". autoblog.com. Retrieved 19 November 2015. ^ "Fiat 124 Spider technical sheet". fiatpress.com. Fiat Chrysler Automobiles. 20 September 2016. Archived from the original (PDF) on 12 January 2017. Retrieved 15 March 2017. ^ "Abarth 124 Spider scheda tecnica" (PDF). abarthpress.com. Fiat Chrysler Automobiles. 6 April 2016. Retrieved 15 March 2017. ^ a b Joseph, Noah (1 March 2016). "Abarth 124 Spider is one furious Fiata". autoblog.com. Retrieved 15 March 2017. ^ "Gagliardo: "Pura ed emozionante, ecco la nostra 124 Spider"". quattroruote.it. 3 March 2016. Retrieved 15 March 2017. ^ "2016 Abarth 124 spider MT". automobile-catalog. ^ "2017 FIAT Abarth-Spider". www.fiatusa.com. Retrieved 2018-04-05. 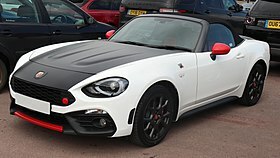 Wikimedia Commons has media related to Abarth 124 Spider.